Background & objectives: Three doses of intermittent preventive treatment with sulphadoxine-pyrimethamine (IPTp-SP) has been adopted as the new recommendation for prevention of malaria in pregnancy. This study evaluated the effectiveness of two-dose versus three-dose of SP for IPTp-SP in the prevention of low birth weight (LBW) and malaria parasitaemia. Methods: An open, randomized, controlled, longitudinal trial was conducted in a secondary level hospital in Nsukka region of Enugu State, Nigeria. A sample of 210 pregnant women within gestational ages of 16–24 wk were recruited at antenatal clinics and equally randomized to either a two-dose SP or three-dose SP group. The primary endpoints were LBWs, peripheral, and placental parasitaemia, while the secondary endpoints were maternal anaemia, pre-term birth, clinical malaria and adverse effects of SP. 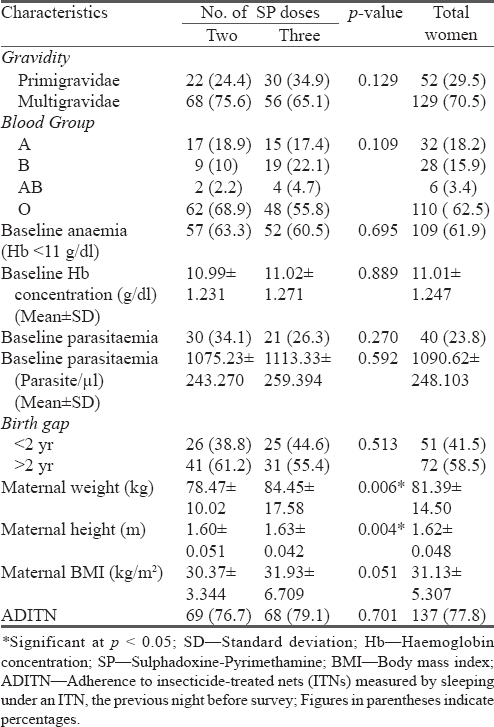 Results: Among 207 cases followed till delivery, the prevalence of parasitaemia was lower in three-dose group than in two-dose group for both peripheral (9.3% versus 27.8%) and placental (10.6% versus 25.6%) parasitaemia. The adjusted odds ratios (aOR) were 0.15 [95% confidence interval (CI), 0.05 – 0.45] and 0.17 (95% CI, 0.06–0.51), respectively. The prevalence of LBW was also lower in three-dose (3.5%) than in two-dose (12.2%) group (aOR, 0.15; 95% CI, 0.04–0.63); however, the prevalence of maternal anaemia, pre-term births, clinical malaria and SP adverse effects were similar between the two arms of treatment. Interpretation & conclusion: Addition of a third SP dose to the standard two-dose SP for IPTp led to improved reductions in the risk of some adverse pregnancy outcomes. No significant differences were found between the socio-demographics of the two treatment arms for the considered variables—Age group, educational level, occupation, alcohol consumption, secondary smoking status, number of people living in the households (p > 0.05), [Table 1]. 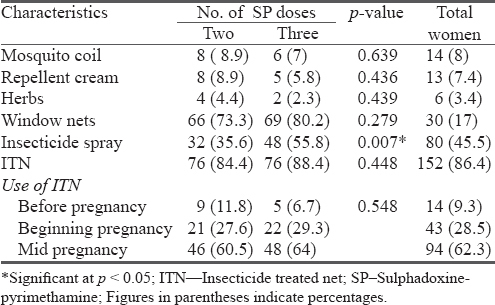 The use of other malaria preventives, apart from IPTp-SP was similar between the two treatment groups except for the use of insecticide spray (p = 0.007). Majority of the women use insecticide-treated bednets (ITNs) (86.4%) and they started using it by the middle of their pregnancy (62.3%) [Table 2]. The two treatment groups had similar obstetric characteristics at baseline except for maternal weight (p = 0.006) and height (p = 0.004). However, their BMI was similar between the two groups (p = 0.051), [Table 3]. Primary outcomes: There was significant risk reduction observed in the following adverse outcomes in the three-dose SP group compared to the two-dose SP group: LBW deliveries [OR = 0.26, 95% CI = 0.07 – 0.96]; peripheral parasitaemia [OR = 0.27, 95% CI = 0.11–0.63] and placental parasitaemia [OR = 0.35, 95% CI = 0.15–0.80]. These risks were further reduced for LBW deliveries, peripheral and placental parasitaemia after adjusting for confounding variables [Table 4]. The risk of having moderate anaemia [OR = 0.76, 95% CI = 0.41–1.41] or severe anaemia [OR=0.51, 95% CI = 0.09–2.87] amongst the women showed a non-significant trend towards reduction for women in the three-dose SP group. A strategic framework for malaria prevention and control during pregnancy in the Africa region 2004. Geneva: World Health Organization Regional Office for Africa. Available from: http:// www.who.int/malaria/publications/atoz/afr_mal_04_01/en/ (Accessed on February 18, 2013). Feng G, Simpson JA, Chaluluka E, Molyneux ME, Rogerson SJ. Decreasing burden of malaria in pregnancy in Malawian women and its relationship to use of intermittent preventive therapy or bednets. PLoS One 2010; 5(8): e12012. Global report: UNAIDS report on the global AIDS epidemic 2010. “UNAIDS/10.11E|JC1958E”. Joint United Nations Programme on HIV/AIDS (UNAIDS). Geneva: WHO Library Cataloguing-in-Publication Data 2010; p. 364. Available from: http:// files. unaids. org/en/media/unaids/contentassets/documents/unaidspublication/2010/20101123_globalreport_en%5b1%5d.pdf (Accessed on February 23, 2013). WHO/GMP, Updated WHO policy recommendation (October 2012): Intermittent preventive treatment of malaria in pregnancy using sulfadoxine-pyrimethamine (IPTp-SP). Geneva: World Health Organization/Global Malaria Programme 2012. Available from: http://www.who.int/malaria/publications/atoz/who_iptp_sp_policy_recommendation/en/ (Accessed on April 21, 2013). Kayentao K, Garner P, van Eijk AM, Naidoo I, Roper C, Mulokozi A, et al. Intermittent preventive therapy for malaria during pregnancy using 2 vs 3 or more doses of sulfadoxine-pyrimethamine and risk of low birth weight in Africa: Systematic review and meta-analysis. JAMA 2013; 309(6): 594–604. Chico M, Mayaud P, Ariti C, Maybe D, Ronsmans C, Chandramohan D. Prevalence of malaria and sexually transmitted and reproductive tract infections in pregnancy in sub-Saharan Africa: A systematic review. JAMA 2012; 307(19): 2079–86. Random.org 1998–2013. Random string generator. Available from: https://www.random.org/strings/ (Accessed on January 7, 2013). Vale I, Tinto H, Drabo MK, Huybregts L, Henry M, Roberfroid D, et al. Intermittent preventive treatment of malaria with sulfadoxine-pyrimethamine during pregnancy in Burkina Faso. Malar J 2010; 9: 324. Diarise OS, Kayentao K, Traoré BT, Djimde A, Traoré B, Diablo M, et al. 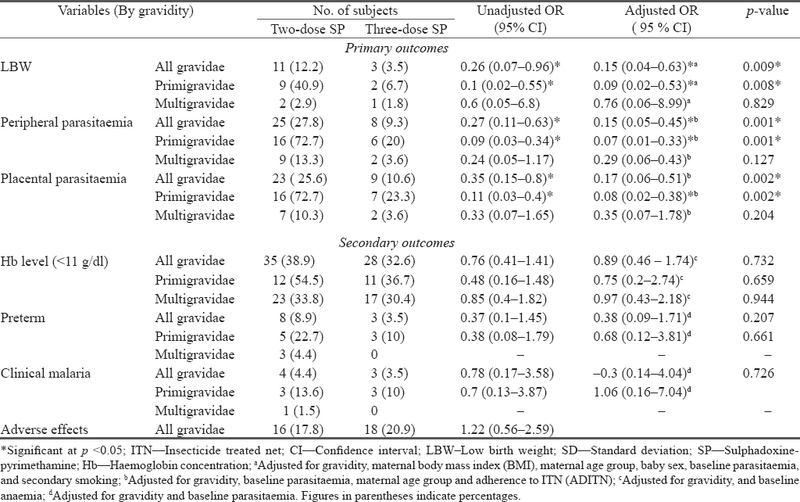 Superiority of 3 over 2 doses of intermittent preventive treatment with sulfadoxine-pyrimethamine for the prevention of malaria during pregnancy in Mali: A randomized controlled trial. Clin Infect Dis 2011; 53(3): 215–23. Agomo CO, Oyibo WA, Odukoya-Maije F. Parasitologic assessment of two-dose and monthly intermittent preventive treatment of malaria during pregnancy with sulphadoxine-pyrimethamine (IPTp-SP) in Lagos, Nigeria. Malar Res Treat 2011; 2011:6. doi: 10.4061/2011/932895. Gamble C, Ekwaru PJ, Garner P, ter Kuile FO. Insecticide-treated nets for the prevention of malaria in pregnancy: A systematic review of randomised controlled trials. PLoS Med 2007; 4(3): e107. Mbaye A, Richardson K, Balajo B, Dunyo S, Shulman C, Milligan P, et al. A randomized, placebo-controlled trial of intermittent preventive treatment with sulphadoxine-pyrimethamine in Gambian multigravidae. Trop Med Int Health 2006; 11(7): 992–1002. van Eijk AM, Hill J, Allegan VA, Kirui V, Getting P, ter Kuile FO, et al. Coverage of malaria protection in pregnant women in sub-Saharan Africa: A synthesis and analysis of national survey data. Lancet Infect Dis 2011; 11(3): 190–207. Gill CJ, MacLeod WB, Mwanakasale V, Chalwe V, Mwananyanda L, Campo D, et al. 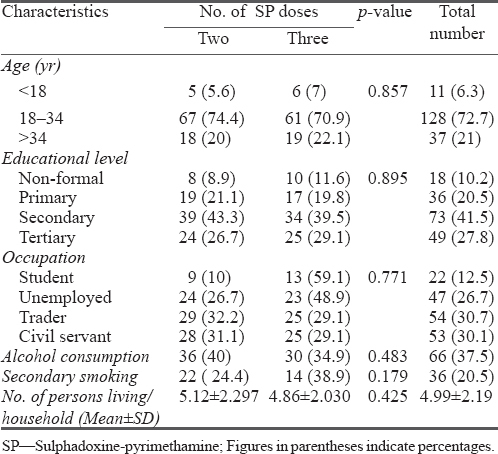 Inferiority of single-dose sulfadoxinepyrimethamine intermittent preventive therapy for malaria during pregnancy among HIV-positive Zambian women. J Infect Dis 2007; 196(11): 1577–84.